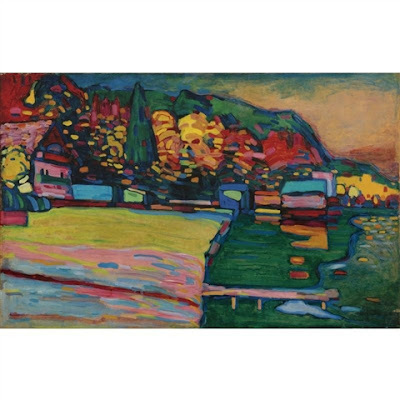 So, you fainted, the Kandinsky colors came to the rescue and you lived to blog about it! Scary and Beautiful at the same time. Glad you’re safe and Mrs Botogol was by your side. Kandinsky: I agree with you looking at this painting one may not think it’s a Kandinsky. It looks more like a painting by his protégé, friend, and lover Gabrielle Münter. They both painted lots of landscape paintings of the beautiful Bavarian country side specifically Murnau. I came to know about this because I have this lovely book that details this period of their lives in pictures, paintings, and a collection of their exchanged personal letters. It’s called: Wassily Kandinsky and Gabrielle Münter Letters and Reminiscences 1902-1914 by Annegret Hoberg. It’s good to have if you like Kandinsky. The steel box: It’s a very clever idea. The Modern Art does it again and brings what is hidden to the fore. It allows us to ‘tangibly’ feel the fear inside each of us mere mortals. One can experience the ‘steel box moment’ any time any where. It’s our own prerogative to deal with this fear whatever it is in whichever way i.e. find and open the door, remain locked, make round trips in and out or circle the four corners of the box…the choices are endless! said hello to good fortune.